* Personalized Your Fitbit Alta / Fitbit Alta HR Smart Fitness Tracker with this refined replacement stainless steel wrist band. 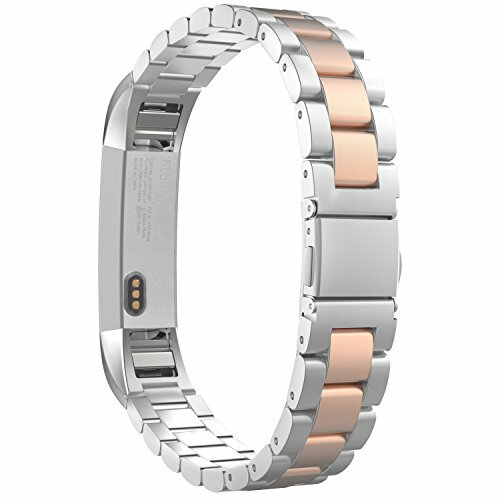 * Band comes with Fitbit Alta / Fitbit Alta HR Smart Fitness Tracker Lugs on both ends, which locks onto Fitbit Alta Watch Band Interface precisely and securely. Easy and direct installation and removal. * Fits 5.9"-8.46" (150mm-215mm) wrist. Comes with one removal tool for adjusting the length of band. Fits 5.9"-8.46" (150mm-215mm) wrist. Comes with one removal tool for adjusting the length of band. Personalized Your Fitbit Alta / Fitbit Alta HR Smart Fitness Tracker with this refined replacement stainless steel wrist band. Durable and sturdy. The strap length can be adjusted easily with tools set.